I had recently seen a recipe for a cheese and broccoli soup that had been on my mind. I had some broccoli in the fridge and I was trying to come up with a way to turn it into a side dish for my maple and mustard glazed chicken dinner. Then I thought about a cheesy broccoli rice which sounded good. There were several ways that I could approach a cheesy broccoli rice and I decided keep it simple and I went with mixing some cooked rice into a bechamel sauce along with some gruyere and parmigiano reggiano cheeses. I was also thinking that a risotto would be nice and creamy and good but a bit more work. As another alternative I was thinking that cheddar cheese would have been good, though it will have to wait for another time. I like to try to use brown rice whenever I can and this was a perfect time to do so. The cheesy broccoli rice was really simple to make and it turned out great! It was nice and creamy and cheesy and good. I was thinking that next time it might be nice to throw it into a baking dish and bake it until the cheese on top turned a nice golden brown. Simmer the rice in the water, covered, until the water is absorbed and the rice is tender, about 20 minutes. Make or heat the bechamel sauce. Stir in the cheeses and let them melt. Stir in the broccoli and cook until warmed. I used to do this stuffed in peppers and baked in the oven – and when I didn’t have the peppers just made the rice on it’s own. The cheese wins the day really. That looks really delicious! So creamy. We always have a broccoli cheese casserole for Thanksgiving. When I was younger I thought it was fabulous but now I don’t like it. I even suggested to my Mom that we replace it with something next year. The reason being is that we make a really cheap, easy version by melting Velveeta onto the broccoli and rice. Yuck. But I am definitely going to try your cheesy broccoli rice. It’s a grown up, sophisticated version of that cheap Thanksgiving staple. Maybe we can replace the bad with the good this year. that looks good!wonder if you could make it with arborio rice? Oh wow, looks delicious Kevin! Oh-so-cheesy! Makes a one-dish meal! mmm. that looks like something my mom always made – chicken divan. it sounds delicious. cheese and broccoli are definitely two of my favorite things! This reminds me of childhood meals. Made your glazed maple carrots tonights. So good. This sounds delicious, indulgent and pretty easy. I have never heard up cooking rice in beschamel sauce and I must try it. This should be a meal all on its own, Kevin!!! Great flavor combo!!! this rice is a really comfort food!! look great! What a fantastic side dish. I always enjoy finding new uses for broccoli. I was wondering what this was this whole week when I saw the chicken recipe! Sounds delicious! I have just made a rice pudding so I’m sure your cheesy broccoli rice would work great baked in the oven. Although I must say, it sounds lovely as is. The love to drown my rice in a pool of yummy sauce.Looks really delicious! This reminds me of my childhood, although when my father “cooked” it was instant from a bag! Beautitful Kevin! 100% – gets my vote and looks fantastic. Good idea! I am going to try making a broccoli and cheddar risotto. Oh Kevin – this looks creamy and so good. I like broccoli and cheese together. I love that you used brown rice. That sounds delicious with your choice of cheeses! That is my most favorite rice, I buy it in a box, but now I dont have to! Cheese and broccoli are great together, this looks so good Kevin! I bet that would be good with brown rice. 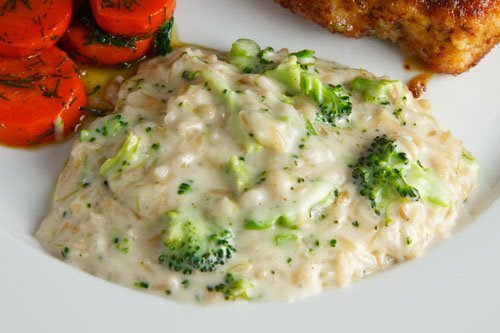 I love the nutty flavor of brown rice and I think it would compliment the cheesy sauce well. Thanks for posting the recipe! Yummm! That looks so good! Sounds so good Kevin, very unusual. Looks great, although I think browning up the cheese would be a nice touch. This looks great! 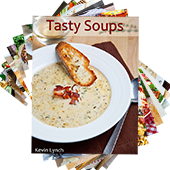 A more sophisticated version of the campbell’s cream of broccoli soup version. I will definitely be making this for my parents when I got home for spring break…they are big fans of broccoli and cheese. You can’t go wrong with parmigiano reggiano and gruyere – looks delicious! I’ve really enjoyed checking out your archived recipes! Your rice sounds so warm and soothing and delicious! Now this is definitely decadent! Great idea… it sounds rich and delicious. That looks great! I don’t like broccoli by itself so this sounds great! I could be happy with a bowl of this! Béchamel + (white) cheeses = Mornay Sauce = YUM! Looks like a comfort food! I liked this – subbed in sharp cheddar for gruyere and roasted the broccoli because I don’t have a steamer – but 1 cup was WAY too much rice. I added cheese though, and everything was better. Looks like something my dog threw up in the back yard. Makes me kind of nauseated just looking at it. r^2: Adding shrimp to make it a meal sounds good! Looks so delicous. where is the recipe?? Broccoli cheese rice is my favourite!!!! Can’t wait to try this lightened up version. Thanks for sharing the amazing recipe.